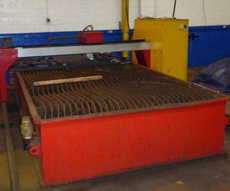 We operate two machines, a CNC flame (oxygen-LPG) cutting machine and a CNC plasma cutting machine. Profiles up to 40 mm thick are generally plasma cut and steel profiles over 40 mm thick are flame cut. The plasma machine is additionally fitted with a servo drill head and arc-writer. The plasma CNC machine is also fitted with a Hypertherm HPR260XD plasma unit. The unit is fitted with Hypertherm’s patented true hole technology for mild steel up to 20mm. This gives significantly better hole quality than has previously been possible using plasma. Steel up to 65mm can be cut with the HPR260. The drill head can be used to create a pilot hole to allow a plasma cut start hole on thicker plate. The arc-writer can be used to mark inside fold lines or positions where items are to be attached and also to engrave identifying text on a part. Our Profile Department is serviced by a 3 tonne overhead gantry.